Less than a month is left now in the start of one of the world’s largest beauty exhibition, Beauty World Middle East 2018. The popular beauty event is assisting the beauty and fashion businesses from across the globe to make their place in the Middle East region since past two decades and its popularity is continuously increasing with every passing year. The event targets beauty industry as a whole and companies related to fashion accessories, perfumes, skincare products, cosmetics etc. participate in large numbers every year. The event is visited by thousands of local and foreign residents along with large number of tourists from all around the globe. This enhances the chances of worldwide marketing of any brand that appears in the exhibition. Therefore, different companies prefer to have their stalls in Beautyworld ME whether they already have their presence in UAE or want to enter one of the world’s most profitable markets. In every season, we see new companies of various fields appearing in this beauty and fashion show. This is also happening this year also. Perfume and fragrance is an ideal market in the UAE and in fact the whole Middle East region. Therefore, this event is an important target of fragrance houses from various parts of the world. 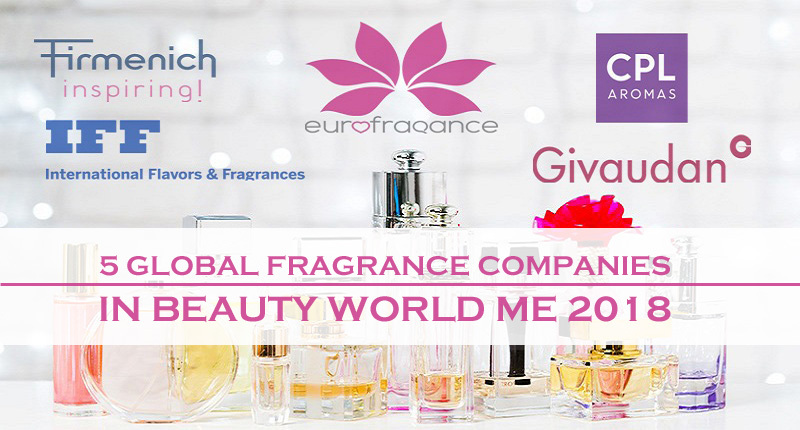 In Beautyworld ME 2018, several famous fragrance companies will be part of the show. Following are 5 of the top brands that will appear in Beauty World ME 2018. CPL Aromas is a UK-based global fragrance company that has expanded its services in more than 100 countries since its inception in 1971. The company has its presence in all the inhabited continents. CPL Aromas introduced its perfume center in Dubai in 2016 and will be one of the many participants in the Beauty World ME 2018 event. Eurofragrance is another international perfume brand that is based in Barcelona (Spain). The company was founded in 1990 and now has its manufacturing units in three continents. The company has its strategic partners in 65 countries of 5 continents. The Spanish fragrance company is also specialist in Arabic Fragrances and they are providing best-selling fragrances in the Middle East since past 25 years. Eurofragrance has now also started providing halal fragrances. It is another global fragrance company participating in the Beautyworld ME 2018. Givaudan is the world’s largest fragrance brand, based in Switzerland, with more than 11,000 employees in over 100 locations. The company was founded in 1895 and now provides its products all over the world. The company is also part of Beautyworld ME 2018. Firmenich is another Swiss brand that is known as the largest private brand and 2nd largest fragrance brand overall. This Swiss company was also founded in 1895 and is known for providing several famous flavors in more than 100 years. The company has around 7,000 employees in 63 facilities and provides fragrances around the globe. The company still needs its marketing through Beauty World ME 2018.
International Flavors & Fragrances (IFF) is a US-based global fragrance company that is in the fragrance market since 1889. With its headquarter in New York, the company has various manufacturing facilities in 35 countries and provides its products all around the globe. It is the world’s 3rd largest fragrance company and will participate in Beautyworld ME 2018 for more exposure. After knowing about the participation of such famous companies in Beauty World ME 2018, there is no doubt left about the importance of the event as far as marketing and exposure is concerned. So, now hurry up to get your registration in the latest event of beauty world. We at Riz & Mona Consultancy can assist you not only in registration in the Beautyworld ME 2018 but also for getting trade license in Dubai if you are interesting in setting up your beauty business in the country.